Beacon connector technology, in tandem with digital signage, can provide an effective cure to make urgent care patients more comfortable. NEW YORK — Juin 27, 2016–(BUSINESS WIRE)–The management of Digital Social Retail (“Digital Social Retail”) will present at the National Investment Banking Association (NIBA) Conference at the Westin New York Grand Central in New York City on June 27th. Sylvain Bellaïche, Founder and Chief Executive Officer of Digital Social Retail, Inc., and Pierre Martin, Chief Financial Officer of Digital Social Retail, will be in attendance during the two-day conference, which takes place on June 26th-27th, and will be meeting with investors in one-on-one meetings. PARIS — December 31, 2016 — Digital Social Retail announces that Courchevel Tourisme has ordered the Social Retail® platform to connect the Courchevel, France ski resort for the 2016-2017 season. The ski resort of Courchevel will thus be able to deliver specific information regarding safety, weather and other topics to the mobiles of its residents and tourists, with an accuracy of a few decimeters. It is important to note that residents and tourists will have previously agreed to receive the notifications. This setup is certainly a world’s first. Several dozen Social Retail® connectors will be positioned in the station, managed by the Social Retail® platform. Sylvain Bellaïche, Digital Social Retail Founder & CEO is featured on the Home Page of DigitalSignageToday.com. The article talks about the challenges franchises face when dealing with Digital Signage. From October 7 to December 31, 2015, the rue des Martyrs in Paris’s 9th arrondissement will be fully equipped with the Social Retail® platform and its beacons offering special offer sent directly to shoppers mobile phones. The group is a partner of the launch edition of Ma Rue Connectee (“My Connected Street”). 08/31/2015: Digital Social Retail announces the creation of “Social Retail Sport” division and will sponsor Israel’s first golf Masters. Digital Social Retail announces the creation of a special division: “Social Retail Sport”. A forthcoming specific solution for this market segment will integrate the technologies used by its Social Retail® platform to disseminate information and “IBeacon” proximity advertising around sports stadiums and events, directed at spectators and fans. 2015.6.17 Digital Social Retail it is the first European company to deploy a beacon installation in an urban environment, and the world’s first outside the United States to disseminate information and proximity advertising by “ibeacon”. Available now on the Google Play Store and App Store! 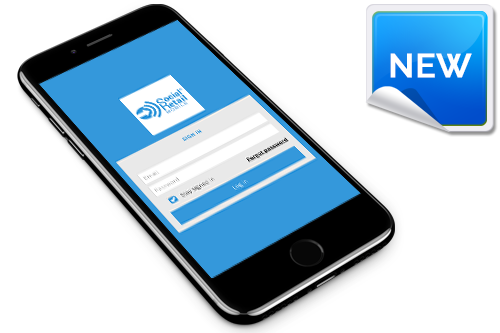 A new way to have all the features and benefits of our Social Retail Platform on your phone while on the go using your mobile phone!